The Dutch Republic Lion (also known as States Lion) was the badge of the Union of Utrecht, the Republic of the Seven United Netherlands and is a precursor of the current coat of arms of the Kingdom the Netherlands. The Flemish lion derives from the arms of the Counts of Flanders. Their first appearance is on a seal of Count Philip of Alsace, count of Flanders from 1168 to 1191, dating from 1163. As such they constitute the oldest of the many territorial arms bearing a lion in the Low Countries. It is said that Philip of Alsace brought the lion flag with him from the Holy land, where in 1177 he supposedly conquered it from a Saracen knight, but this is a myth. However, Count Philip was not the first of his line to bear a lion, for his cousin, William of Ypres, already used a seal with a lion passant in 1158. The simple fact that the lion appeared on his personal seal since 1163, when he had not yet set one step in the Levant, disproves it. Ypres is a Belgian municipality in the province of West Flanders. Though the Flemish Ieper is the official name, the city's French name Ypres is most commonly used in English. The municipality comprises the city of Ypres and the villages of Boezinge, Brielen, Dikkebus, Elverdinge, Hollebeke, Sint-Jan, Vlamertinge, Voormezele, Zillebeke, and Zuidschote. Together, they are home to about 34,900 inhabitants. In the same period lions also appeared in the arms of Brabant, Luxembourg, Holland, Limburg and other territories, most importantly England. It is curious that the lion as a heraldic symbol was mostly used in border territories and neighbouring countries of the Holy Roman Empire and France. It was in all likelihood a way of showing independence from the emperor, who used an eagle in his personal arms and the King of France, who used the famous Fleur-de-lis. In Europe the lion had been a well-known figure since Roman times, through works such as the fables of Aesop. In the story about the Guldensporenslag, the arms and its corresponding battlecry Vlaendr'n den leeuw ("Flanders, the Lion!") plays a crucial role in the forming of a Flemish consciousness, which was popularised in recent times by the book De Leeuw van Vlaanderen by Hendrik Conscience. As a result, the arms of the county live on as arms of the Flemish Community. The Arms of Brabant were first used probably by Count Lambert I of Louvain, the lion is also documented in a 1306 town's seal of Kerpen, together with the red lion of Limburg. Today these arms are used by the Kings of the Belgians. Lambert I of Louvain nicknamed "The Bearded" was the first Count of Louvain in 1003. He was killed by Godfrey II, Duke of Lower Lorraine in battle for Godfrey's claim of Count of Verdun. Kerpen is a town in the Rhein-Erft-Kreis, North Rhine-Westphalia. Germany. It is located about 30 kilometres southwest from Cologne. The Duke of Brabant was formally the ruler of the Duchy of Brabant since 1183/1184. The title was created by the German Emperor Frederick Barbarossa in favor of Henry I of the House of Reginar, son of Godfrey III of Leuven. The Duchy of Brabant was a feudal elevation of the since 1085/1086 existing title of Landgrave of Brabant. This was an Imperial fief which was assigned to Count Henry III of Leuven shortly after the death of the preceding Count of Brabant, Count Palatine Herman II of Lotharingia. Although the corresponding county was quite small its name was applied to the entire country under control of the Dukes from the 13th century on. In 1190, after the death of Godfrey III, Henry I also became Duke of Lotharingia. Formerly Lower Lotharingia, this title was now practically without territorial authority, but was borne by the later Dukes of Brabant as an honorific title. Arms of the Dukes of Gelderland showing the arms of Gelre and Jülich. Arms of the Counts of Hainaut quartering Flanders and Holland. Arms of the Counts of Namur based on the arms of Flanders. Arms of the Counts of Zeeland based on the arms of Holland. Arms of the Dukes of Limburg based on the arms of Luxemburg. Arms of Overijssel, based on the arms of Holland. 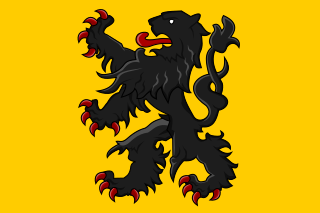 When the county of Flanders was inherited by the Dukes of Burgundy in 1405, the Flemish lion was placed on an escutcheon in their dynastic arms (see Armorial of the French Royal House or Armorial of Dukes of Burgundy). The same happened with the duchy of Brabant (and its dependent duchy of Limburg) in 1430, but oddly not the county of Holland in 1432. These passed with the rest of the Burgundian inheritance to the House of Habsburg in 1482. Their descendants, the Kings of Spain (see Monarchy of Spain bear the title and arms of the county of Flanders (Holland was renounced in 1648 with the Treaty of Westphalia) and the duchy of Brabant to this day (see Coat of arms of the King of Spain and List of titles and honours of the Spanish Crown). The lion, as representing the Burgundian Netherlands, first appears as a crest on the tomb of Philip the Handsome. Later Charles V added the sword. The arrows were used, on coins etc., since the early 16th century to represent the Seventeen Provinces in the low countries under control of Charles V.
In 1578, during the Eighty Years' War, the States General ordered a new great seal representing the lion, the sword and the 17 arrows combined. Although only seven provinces remained free from Spain, this seal stayed in use until 1795. The tinctures were inverted in 1665[ citation needed ] to a gold lion on red to be more representative of all the provinces of the union. When the provinces of Brabant, Gelderland, Flanders, Holland, Zeeland, Friesland, Mechelen and Utrecht on 26 July 1581 signed the Act of Abjuration declaring their independence from Spain and Philip II, these arms became the arms of the new nation. The sovereignty of the federal union was emphasized by the title of the States General "their Noble Mightinesses, the Lords States-General" or, in Dutch, "Den Heeren Hoog-Mogenden, Den Heeren Staten-Generaal der Verenigde Provinciën der Nederlanden"). and by a crown on the lion in their arms. Coat of arms of the republic of the united Netherlands (c. 1665). Sternpiece of the Zeven Provincien. Coat of arms of the republic of the united Netherlands (after 1665). Fireplace of the Kruithuis (Delft). Arms of the Dutch Republic. The number of arrows changed over time. At first there were 17, despite the fact that the Union of Utrecht counted 11 districts after the Fall of Antwerp in 1585. It was hoped by William the Silent that all the Seventeen Provinces of the Netherlands would eventually be united. However, this was not to be, and so it was eventually changed to 11, and with the Reduction of Groningen to 7. The number of arrows on the arms fixed at 7 in 1606, but the seal still remained with 17 arrows until 1795. The Royal Prince and other vessels at the Four Days Fight, 11–14 June 1666 (Abraham Storck) depicts a battle of the Second Anglo-Dutch War. In the foreground the Swiftsure with Berkeley sinks. On the right the grounded Prince Royal with admiral Ayscue surrenders by firing white smoke; de Ruyter on the Zeven Provinciën accepts. In between the Royal Charles can just be seen with a broken mast. The stern piece of the Zeven Provinciën shows the old arms of the United Provinces. Anjou's arms as sovereign of the Netherlands. Right corner,clockwise: Gelderland, Holland, Flanders, Brabant. Left corner, clockwise: Friesland, Overijssel,Utrecht, Zeeland. Bottom: Mechelen. In the 1st and 4th quarter, the French lilies (undifferenced, i.e. without his red bordure as Duke of Anjou. At the time of the Dutch declaration of independence the territory under nominal States-General control was steadily shrinking. Parma made steady progress. Orange had already been convinced that the only way to avert total defeat was to regain support of the moderates, alienated by Calvinist radicalism; reassure the still-loyal Catholics in the South; and retain the trust of the German Lutheran princes and the king of France. To attain these objectives he now persuaded the States-General to offer sovereignty over the Netherlands to the younger brother of Henry III of France, François, Duke of Anjou, who in 1578 had already intervened on behalf of the States-General. The latter arrived in Antwerp in January 1581, where he took an oath to in effect govern as a "constitutional monarch", and was acclaimed by the States-General as Protector of the Netherlands. At the time of his sovereignty, Anjou replaced the Generality Lion by arms that he himself designed incorporating all the arms of the, at that time, nine Dutch rebellious provinces with France. 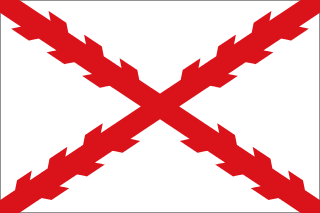 After that the States-General re-established the previous arms. The Batavian Republic founded in 1795 used in its first year the arms of the Dutch Republic, i.e. the Dutch lion or lion with crown, sheaf of arrows and swords. But on May 4, 1796, the Dutch Lion badge was replaced by a free drawing of the Netherlands Maiden around an altar with an anchor, and the States Lion with her. 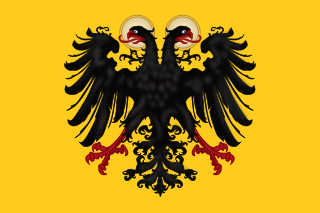 The substitution in 1801 of the Batavian Republic by the Batavian Commonwealth, whose main feature was a stronger Grand Pensionary acting the part locally of the First Counsul Bonaparte also had its impact on heraldry. On April 12, 1802, it was decided that the new badge of the Commonwealth would be a golden lion on a red field again. The number of arrows that bears the lion in the leg was not established. This remained in use until the Kingdom of Holland was formed in 1806 for Napoleon's brother, installed as King Louis I of Holland. Napoleon's brother Louis Bonaparte was installed as King of Holland on 5 June 1806. Originally the arms of the new kingdom were to be like those of the Kingdom of Italy: an eagle bearing a shield, with the arms of the United Netherlands, the lion, now royally crowned. In December 1806, A. Renodi in Paris designed arms quartering the Napoleonic eagle with the lion of the United Netherlands. Around the shield was the French Order of the Grand Aigle. Behind the shield are crossed sceptres, typical for Napoleonic heraldry, and above the shield, Napoleon's star. A few months later, on 20 May 1807, King Louis (now called "Lodewijk") altered these arms, adding a helmet, leaving out his brother’s star and replacing the Grand Aigle with his own Dutch Order of the Union and the old Dutch devise Eendracht maakt macht ("Unity makes strength") around the shield. Exemplary for the innovation in Napoleon's heraldry are the two hands coming out of clouds from behind the shield holding swords, designating King Louis as Connétable de France. Coat of arms of Holland (1806). Coat of arms of Holland (1808). Arms of the States-General of the Dutch Republic. The sword symbolizes the determination to defend the nation, and the bundle of 7 arrows the unity of the 7 United Provinces of the Dutch Republic. Arms of the House of Nassau, of which the Princes of Orange were a cadet (the Ottonian) branch. Coat of Arms of the Sovereign Principality and William VI of Orange 1813-1815. 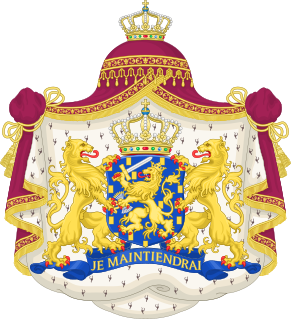 Coat of Arms of the Netherlands and the Dutch Monarch 1815-1907. Coat of Arms of the Netherlands and the Dutch Monarch after 1905. There were two Unions of Brussels, both formed in the end of the 1570s, in the opening stages of the Eighty Years' War, the war of secession from Spanish control, which lasted from 1568 to 1648. Brussels was at that time the capital of the Spanish Netherlands. The Siege of Eindhoven, also known as the Capture of Eindhoven of 1583, took place between 7 February and 23 April 1583 at Eindhoven, Duchy of Brabant, Spanish Netherlands during the Eighty Years' War and the Anglo-Spanish War (1585–1604). On 7 February 1583 a Spanish force sent by Don Alexander Farnese, Governor-General of the Spanish Netherlands, commanded by Karl von Mansfeld and Claude de Berlaymont laid siege to Eindhoven, an important and strategic city of Brabant held by Dutch, Scottish and French soldiers under the States' commander Hendrik van Bonnivet. After three months of siege, and the failed attempts by the States-General to assist Bonnivet's forces, the defenders surrendered to the Spaniards on 23 April. In Dutch and English historiography the Dutch struggle for independence from the Spanish Crown in the 16th and 17th century was long known as the Eighty Years' War. More recently, the initial part of this period has become known as the Dutch Revolt. This concept covers the period between the initial insurrection of Netherlandish Calvinists against the regime of the Governor of the Habsburg Netherlands, Margaret of Parma, in 1566, and the conclusion of the so-called Twelve Years' Truce in 1609 between the Spanish Crown and the Dutch Republic. The historiography of this period covers both political and diplomatic developments, and events in Military history. But the period of the Truce, and the military events that followed after the Truce had ended and the war was resumed, until the conclusion of the Peace of Münster in 1648, still form one continuous whole with the Dutch Revolt,, and this continuous narrative, spanning the period 1566 - 1648, is still known as the Eighty Years' War. This narrative was once covered in one article, but has been split into three separate articles, of which this covers the military history aspects of the Dutch Revolt period. The Malcontents in the context of the Eighty Years' War or the Dutch Revolt were a faction of Catholic nobles in Hainaut and Artois who openly opposed William the Silent, also known as Orange, the leader of the States General of the Netherlands in the Union of Brussels of the Habsburg Netherlands during the period after the adoption of the Pacification of Ghent. They formed the Union of Arras in January 1579 and negotiated a separate peace with the Spanish Crown, represented by the royal governor-general Alexander Farnese, Duke of Parma, in the form of the Treaty of Arras (1579), signed on 17 May 1579. ↑ "Wapens van leden van het Koninklijk Huis". Coats of Arms of the Dutch Royal Family, Website of the Dutch Monarchy, the Hague. Rijksvoorlichtingsdienst (RVD), the Hague, the Netherlands. Archived from the original on June 7, 2012. Retrieved April 30, 2012. Bij Koninklijk Besluit van 10 juli 1907 (Stb. 181) werd het Koninklijk Wapen, tevens Rijkswapen, aangepast. De leeuw in het schild en de schildhoudende leeuwen droegen vóór die tijd alle drie de Koninklijke kroon, maar raakten deze kwijt nu de toegevoegde purperen hermelijn gevoerde mantel, gedekt door een purperen baldakijn, een Koningskroon ging dragen. De schildhouders waren vóór 1907 bovendien aanziend in plaats van en profiel. 1 2 "The Official Website of the Dutch Royal House in English". Archived from the original on May 30, 2013. Retrieved 26 April 2011. 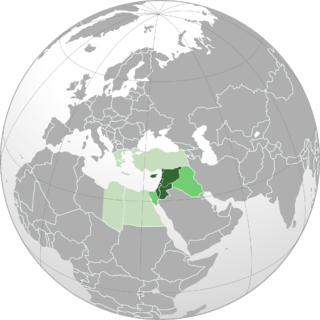 Wikimedia Commons has media related to Republic of the Seven United Netherlands . Motley, John Lothrop (1855). The Rise of the Dutch Republic. Harper & Brothers. Rowen, Herbert H. (1978). John de Witt, grand pensionary of Holland, 1625-1672. Princeton University Press.